If you thought you could just sweep the princess off her feet in a set of shorts and an undershirt, you've got a lot to learn. Princess have to be wooed. You can't just pick one like a jam at the store and expect it to just hop in the basket... we realize that comparison got a little confusing. We'll try again. A Princess is not easy to obtain. You'll need to speak smoothly, present yourself gracefully, be polite all the time, and of course you'll need a healthy dose of charm (princesses love charm). All of these are requisite if you want to win over the heart of the Princess. And, to return to our point about shorts earlier, you'll also need to dress to impress. Especially for formal events. Dates should include ties and shiny shoes. Dinner may require a suit coat. And if you're taking the princess to a wedding (even if it's not yours) you'll need some particularly fancy dress clothes. And if you need some elegant royal clothes, try our Royal Prince Costume on for size. It has a long red jacked with golden collar and shoulder accents. There's black pants and a blue satin shoulder sash. 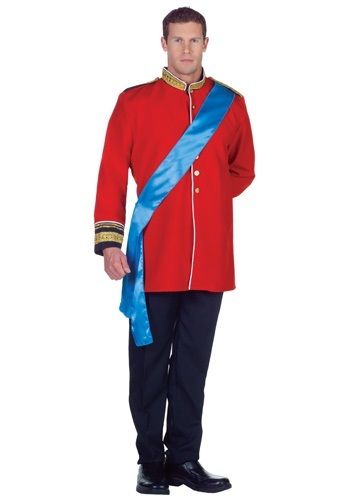 You'll be sure to look like royalty in this get-up. That should make the Princess happy. And even if she's not happy, at least you'll be the most dapper prince in the land. Cheers to you! Standard size runs a little big. Pants have an elastic band in waist. Fair quality for price.